It was my little cousin's birthday recently, and she really likes Hello Kitty. 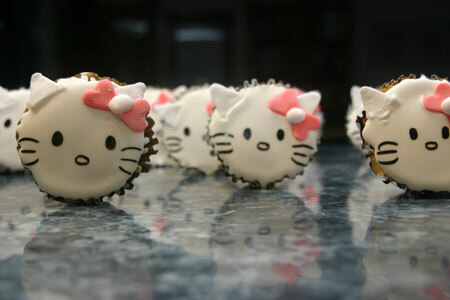 Her parents were making her a Hello Kitty cake, so Mum and I did a bit of research and decided to create Hello Kitty Cupcakes. For those of you who don't know Kitty (God forbid) here is the real deal. That's just her face. She does have a body. Now, on to the cake. I used a cream cheese pound cake recipe found on Bakerella's blog for the cupcake, with royal icing, fondant and edible ink marker for her face. 1. Preheat oven to 160 degrees Celsius. 2. 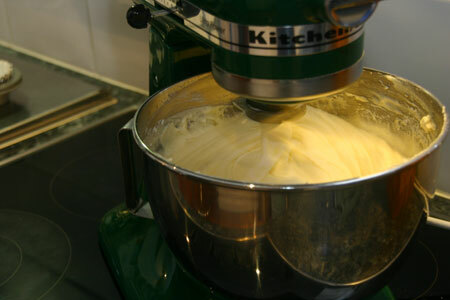 Cream butter, cream cheese and sugar using electric mixer for about 6 minutes. 3. Beat in eggs one at a time. 4. Add vanilla and milk, beat until combined. 5. Add flour and mix in until combined. This cake batter is scrumptious, and you can barely taste the cream cheese! 6. 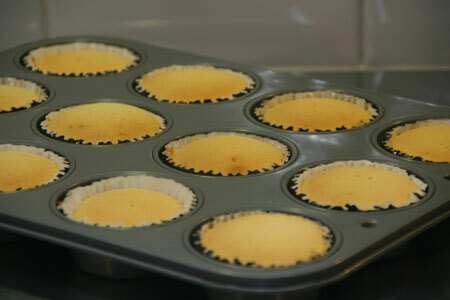 Prepare a cupcake pan (or two) with paper patty pans. 7. Using a spoon and spatula, fill the patty pans 1/2 to 3/4 full with the cake batter. Smooth the tops down with the spatula and make sure the amount of batter in each patty pan is about even. 8. Bake in the oven for about 30 minutes, or until well risen and slightly browned. I could just eat them. But I didn't. Don't be worried if they seem too rounded, they sink a little and become more or less flat. 1. Separate the egg yolk from the egg white. 2. 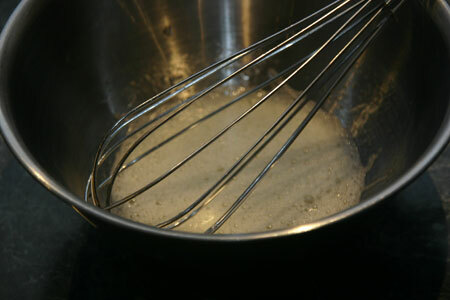 Using a whisk, beat the egg white until foamy - not peaks. Just foamy. Add the lemon juice and beat that in. 3. 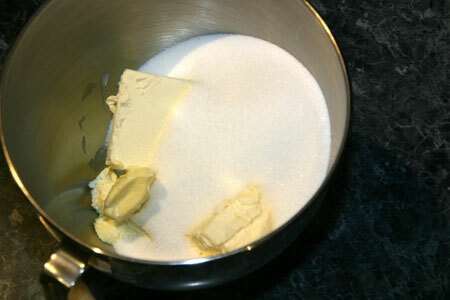 Add some icing sugar (go about 1/2 a cup each time) and mix it in. Depending on how runny you want your icing, add the icing sugar to your tastes. For these cupcakes, I made the icing sugar stiffer but still runny. Test the icing by picking some up with the whisk and dribbling it back into the bowl - for Hello Kitty, make sure that the dribbled icing 'melts' back into the icing in the bowl. 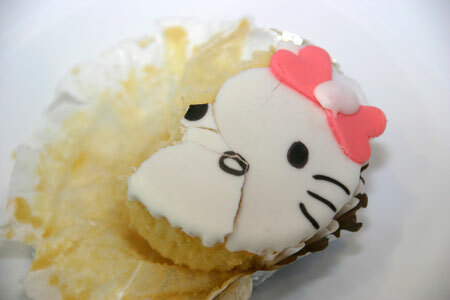 This will mean that Hello Kitty's face will be flat. 4. 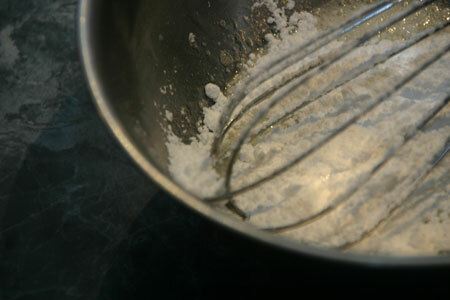 Set the icing bowl aside and sprinkle your clean workspace with pure icing sugar. This is so the fondant doesn't stick to the table. 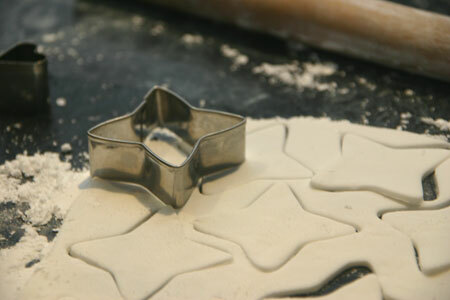 Sprinkle the fondant with icing sugar and knead until it is workable. 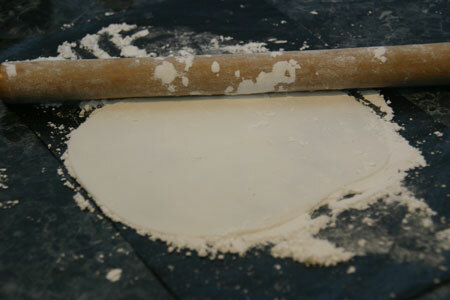 With a rolling pin, roll the fondant out to about 1 - 2mm thick. 5. 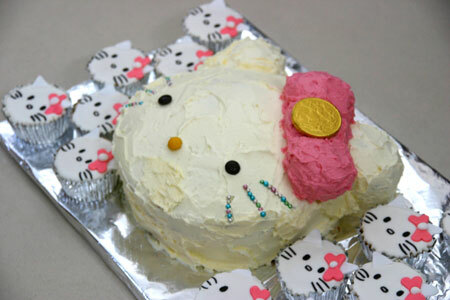 Use a cutter like the one shown below, a triangle or a knife to cut out Hello Kitty's ears. After cutting out the shapes with the cutter, I chopped off the points with a knife for her ears. Save the offcuts - you'll need them. 6. Using the ear offcuts and more fondant if needed, add pink food colouring and knead until the fondant is a solid pink with no streaky bits. 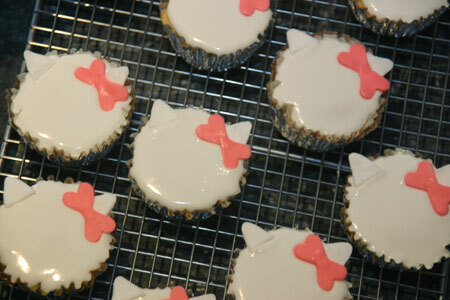 Using a small heart cookie cutter, or a knife, cut out two hearts for each Hello Kitty cupcake. These hearts are for the bow. When you're done, pair up the hearts and stick the pointy bits together. Use some water if needed. Don't worry about squishing them too much, you won't see them under the bow 'knot'. 7. 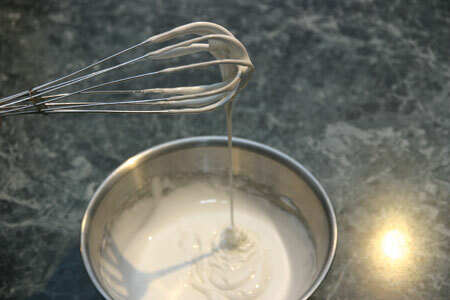 Using a spoon and spatula, drop some royal icing onto the cupcakes. 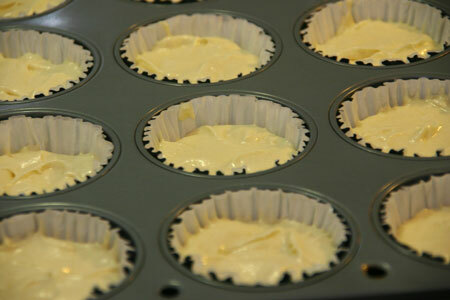 Make sure you don't put too much on, as they'll overflow, but make sure there's a generous covering. 8. 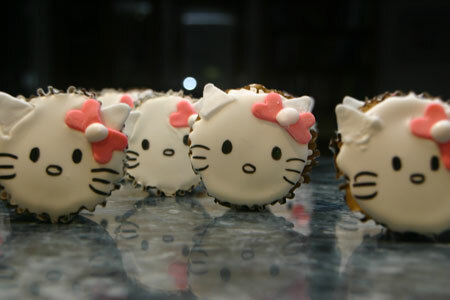 When the icing is completely hard, use an edible ink marker (or, alternatively, royal icing tinted black) to draw on Hello Kitty's eyes, nose and whiskers. Look at a picture of her face on the internet first, model one cupcake on that then copy the design onto the other cupcakes. Put some of the royal icing into a ziploc bag, and cut a small hole in one corner. Push the icing to that corner so it can squeeze out the hole. 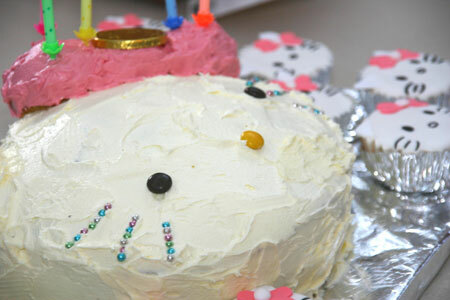 Squeeze small amounts of icing onto the join between the two hearts of Hello Kitty's bow. 9. Admire their cuteness and simplicity of design. As Mum says, "Kitty is designed with the 'decoratively challenged' in mind." - Make sure Kitty's bow isn't too far down her face/too slanted. If it is, then you have to make her eyes closer together which squishes her face up a bit. (e.g. 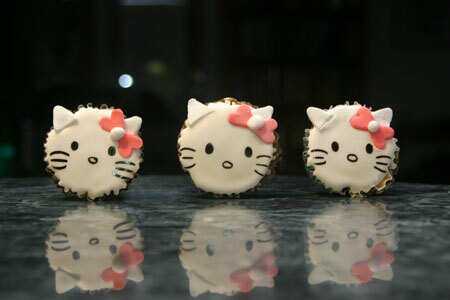 the cupcake on the far right in the above picture). As I said before, my Auntie and Uncle made a big Kitty cake. They used a buttermilk butter cake recipe with buttercream icing. Her bow had strawberry essence in the icing so it was lovely and fruity. They did an amazing job! Lookit! It's Hello Kitty and all her little minions! Well done. They are so cute! Keep up the baking! Thanks for the comments, everyone! They were lots of fun to make. I think I want this for my birthday! @ Megan : Thank you! I hope you had fun with your cupcakes! These are absolutely adorable! I'm almost ashamed to admit to squealing like a little girl when I saw these! @ Danae : Don't be ashamed, they are adorable! Thanks for the comment! An Australian girl who loves baking, food photography and far too much chocolate. Come and enjoy my adventures with me! All photos and deliciousness by The Speeding Turtle unless otherwise stated. Theme images by Ollustrator. Powered by Blogger.